The cuisine of Devon in England has influenced, and been influenced, by other British cuisine. As of 2012, Devon boasts a Michelin Guide two-starred restaurant at Gidleigh Park and three other one-starred establishments. Several high-profile restaurant owners have relocated to Devon, to take advantage of its high quality produce, including Damien Hirst, Hugh Fearnley-Whittingstall and Mark Hix with a particular cluster in East Devon around Axminster, Ilfracombe and nearby Lyme Regis on the Dorset border. Another gastronomic cluster in the South Hams centred on Totnes, Dartmouth and Modbury, results from these communities pioneering of the Transition Towns concept to develop a sustainable relationship between producer and consumer in the rural economy, while the historic towns of Tavistock, Okehampton and Widecombe-in-the-Moor remain well known for their ancient seasonal markets. In October 2008, Devon was awarded Fairtrade County status by the Fairtrade Foundation. A monthly county magazine, Devon Life, regularly publishes articles on the food and drink of the county, and the Cornish & Devon Post, a newspaper published in Launceston, also publishes Cornish & Devon Farming Diary and a yearly eating and entertainment guide, Country Cuisine. The pasty is as popular in Devon as it is in Cornwall, and the earliest known record for the recipe was from the city of Plymouth in 1510, on the Devon-Cornish border. Naturally, this is one of the principal sources of rivalry between the two counties, which in fact form a cultural continuum across the Westcountry, however pasties made in Devon lack Protected Designation of Origin. White pudding is a highly spiced pork dish still popular in Devon and Cornwall, where it is known as Hog's pudding; versions are known from the West Midlands, Scotland and elsewhere. A variant version containing oats is known as "Groats pudding" and is found on Dartmoor and parts of Cornwall. 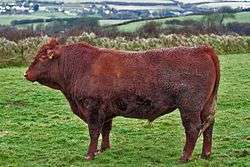 Both Dartmoor and Exmoor are well known for their production of wild, free-grazing beef and lamb from regional breeds such as Red Ruby Devon Cattle, South Devon cattle, the Greyface Dartmoor and the Devon Closewool sheep. Fish and chips also remain particularly popular in the many coastal fishing ports. In New South Wales, Australia, Devon is a name for luncheon meat (processed ham) but is unknown in England. The name changes in different states of Australia (for example, 'Fritz' in South Australia, 'Polony' in Western Australia) but all describe the same type of meat. The county has given its name to a number of culinary specialities. 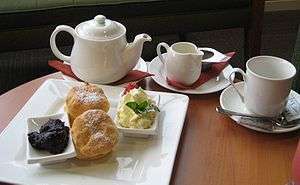 The Devonshire cream tea, involving scones or rather Devonshire Splits, jam and clotted cream is considered to have originated in Devon (though claims have also been made for neighbouring counties); in other countries however, such as Australia and New Zealand, it is known as a "Devonshire tea". Ice cream is also made by many Devon creameries and is known for its luxurious rich full cream taste. Curworthy, Sharpham and Vulscombe cheeses are all made in Devon. Devon Blue and Beenleigh Blue are made at a dairy on the Sharpham Estate. Devon Blue won an award for the best English cheese in 2011. The Ambrosia creamery with its famous tagline "Devon knows how they make it so creamy", best known for its custard and creamed rice pudding has been based in the village of Lifton since 1917. Junket is a dairy foodstuff known historically as the food of courting lovers and the base product of the initial stage of the cheesemakingprocess.It can occasionally still be found on traditional menus. Fudge, often made with Devon clotted cream, can be found all over Devon. — p 319, North Carolina Medical Journal, Volumes 19-20, 1887. Potatoes feature prominently after presumably having been introduced to Devon and the rest of Europe by Sir Walter Raleigh of East Budleigh, they formed a major part of the peasant diet in the nineteenth century. An exceptional number of traditional varieties of apple are specific to Devon's ancient orchards, which shares a history of cider production with its Westcountry neighbours along with rare varieties of many other fruits including the Dittisham plum, a dessert variety grown there. The Tamar Valley was historically famous for its early season production of soft fruits in its sheltered south-facing valleys which were exported to London by rail. Today, Riverford distributes its produce via an organic box scheme across the whole of the UK. Devon has a large number of beer breweries; two well known ones being Otter Brewery (located at Luppitt near Honiton) and Dartmoor Brewery, which, being based in Princetown on Dartmoor, is the highest brewery in England at 1,400 feet (430 m) above sea level. The Heavitree Brewery was a local brewer, located in Heavitree; its history can be traced back to 1790. It was the last brewery in Exeter to cease production, continuing until 1970, the brewery buildings were demolished in 1980. The name continues in use as the owner of a chain of pubs in south west England, and Heavitree Brewery PLC continues as a quoted company with its address in Exeter. The Plymouth Gin Distillery has been producing Plymouth Gin since 1793, which was exported around the world by the Royal Navy. During the 1930s, it was the most widely distributed gin and has a controlled term of origin. There are now a number of vineyards in Devon producing white wines, the oldest being Yearlstone Vineyard which was started in 1976 at Bickleigh in the valley of the River Exe. Others include Sharpham Vineyard, near Totnes, and Pebblebed Vineyard near Topsham. The monks of Buckfast Abbey still produce Buckfast Tonic Wine which has attracted an unlikely down-market cult status in Scotland. Luscombe Organic Drinks, near Buckfastleigh produces high quality organic fruit-based adult soft drinks and Luscombe Organic Devon Cider. The drinks are available across the UK in restaurants, bars and cafes. Devon has a strong association with the old Westcountry tradition of alcoholic cordials such as Lovage, Grenadine and Shrub. 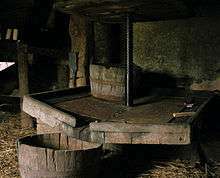 These traditional drinks and mixers are still produced today by J R Phillips of Bristol. ↑ "Devon Farming : Lobby Information Pack" (PDF). Devon.gov.uk. Retrieved 2013-11-10. ↑ "The New Economy - Brixham Fish Quay". Archived from the original on April 5, 2012. Retrieved October 16, 2011. ↑ "Michelin List". Backupemail.designrestaurants.com. Retrieved 2013-11-10. ↑ "Food & Drink - Events". Devon Life. Retrieved 2011-10-21. ↑ "Devon invented the Cornish pasty". BBC News. 2006-11-13. ↑ "The Devon Pasty War - 2006". Legendarydartmoor.co.uk. Retrieved 2013-11-10. ↑ "Dartmoor Hogs Pudding". Legendarydartmoor.co.uk. Retrieved 2013-11-10. ↑ Slater, Nigel (2010-08-22). "Nigel Slater's Devonshire cream tea recipes". The Guardian. London. ↑ "British Cheese Awards". The Cheese Web. Retrieved 2011-10-21. ↑ "The Apple and Fruit Directory ~ Devon Apples ~ Informative Apple and Fruit Resource". Devon-apples.co.uk. Retrieved 2013-11-10. ↑ "Dartmoor Brewery: About Us". Dartmoor Brewery. Retrieved 2009-09-22. ↑ "South Devon Breweries". South Devon CAMRA. Retrieved 12 July 2016. 1 2 Andrews, Robert (2004). The Rough Guide to Devon & Cornwall. Peter Hack, Kate Hughes, Bea Uhart (2 ed.). Rough Guides. p. 139. ISBN 978-1-84353-312-2. Retrieved 2009-07-26. ↑ "Devon's Oldest Vineyard". Yearlstone Vineyard. Retrieved 2011-10-21.